The last time we tackled the topic of films in which "animals attack!" we focused on movies with a sense of humor. Not the over-the-top, look-how-silly sort of humor we know and (sometimes) love from the Dinocroc and Sharknado producers, but the sly, tongue-in-cheek wit you'd get from the likes of Slugs, Piranha, and Black Sheep. But after offering up so many "light" movies in which human beings get horribly devoured by hungry beasts, we thought it only fair to shine a light on the downright, seriously, out-and-out scary "animal attack" movies. That's not to say that the 10 movies listed below are bereft of humor (not even close), just that the main intent of these films is to creep you out, not make you chuckle. Warning: Because the movies below all fall into the "horror" genre, some of the content included within the trailers below might be slightly graphic for some tastes. You'll of course forgive the obviousness of this (and the following) inclusion, but you simply cannot talk about high-end "animal attack" movies without mentioning Alfred Hitchcock's 1963 classic The Birds. Before this wonderfully suspenseful horror film hit the screens, "animal attack" stories were generally presented with a lighter (often sillier) sensibility. It took a craftsman of Hitchcock's stature to illustrate how damn scary a "simple" animal can be. From the slow-burn setup and essential character beats to the most iconic moments—such as a wonderful sequence in which a schoolyard is overrun by crows—"The Master of Suspense" seems to take great delight in delving into full-bore shock, awe, and horror. But since it's Hitchcock, there's still an omnipresent sense of class, restraint, and devious wit. Plus it's got some special effects that were pretty damn staggering in the early '60s—and still hold up pretty well today. This is one scary movie. We'd be willing to bet that human beings are born with an instinctual fear of being eaten by a large animal—and rare is the movie that captures that sensation so well. From the panicked gasps of poor Chrissy as she becomes a hungry shark's first victim to the horrific demise of Quint during the big finale, Spielberg seems well aware of how horrifying a shark attack must be—and so he fills the rest of the film with humor, warmth, and character. We quickly grow to care for Chief Brody, his family, his townsfolk, and his new allies in their fight against a furious fish, and that's what makes the scary stuff work so well. The fact that Jaws is just as popular today as it was 40 years ago kind of says it all. If you haven't seen the film in a few years, you really need to treat yourself to a revisit. Though it's most assuredly a B-level "drive-in double feature" sort of animal attack movie, there's still something quaintly appealing and legitimately creepy about this low-budget tale in which all sorts of nature runs wildly amok. Director William Girdler (who previously gave us 1976's Grizzly, which is also pretty solid) seems to take equal inspiration from The Birds, Jaws, and Irwin Allen's disaster epics, and the result is a dark adventure in which a cast of (sort of) big stars do battle with a wide array of highly unhappy animals. If Leslie Nielsen versus a bear isn't enough to pique your interest, how about Christopher George, Lynda Day George, Richard Jaeckel, and Andrew Stevens versus mountain lions, snakes, birds, rats, and dogs? It's an all-out animal battle royale in Day of the Animals, and while it's simply a fun piece of low-budget, mid-'70s genre history, the movie does earn points for being one of the earliest eco-horror flicks to cite the rapidly depleting ozone layer as the cause for all the carnage. That's pretty prescient stuff for a wacky little horror movie, right? Arguably not much more than a considerably more subtle and cerebral take on movies like Day of the Animals, Long Weekend earns a lot of points for avoiding the typical "animal attack" tropes, for focusing on character and set-up over pointless explanations, and for bringing a sobering, sci-fi-style approach to a concept that's usually mined for simple scare scenes. This might not be the most action-packed film on this list, but it might just be the creepiest. Note: the 2008 remake (a.k.a. Nature's Grave) is not nearly as good as the original. Dog lovers, beware: Cujo is about a mother and young son who become trapped in a broken-down car, in the middle of nowhere, in desperately hot weather, with an insanely rabid dog roaming the immediate proximity. More of a gruesome suspense thriller than a nonstop "animal attack" chomp-fest (although the crazed canine does nail a few peripheral characters pretty well), Cujo still holds up remarkably well today—partially because the scary moments are so well-realized, but also because the two leads (Dee Wallace and Danny Pintauro) sell the escalating horror with each passing scene. Few things are as imposing as a wild boar, mainly because they're mean and aggressive, but also because they're just disgusting. 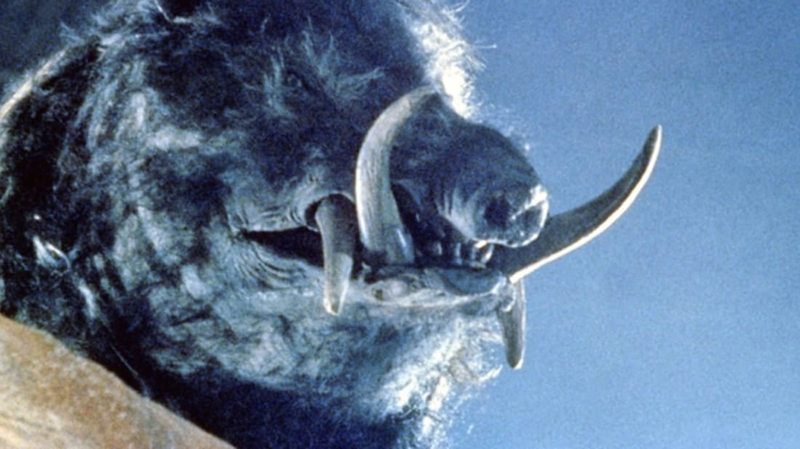 A giant pig with tusks might not be as primordially horrifying as a shark or a tiger, but you sure as hell wouldn't want to mess with one. Arguably one of the most stylish and confident of the myriad Jaws knock-offs that populated the late '70s and early '80s, the fantastic Australian horror flick Razorback is about a gigantic wild boar that terrorizes a small outback community—and this is one nasty beast indeed. Directorial debut of Russell Mulcahy (he'd go on to do Highlander thanks in large part to his work here), Razorback nails the essential points by giving us a horrible monster and a few characters worth pulling for, but it's probably best remembered for its nasty disposition and its unexpectedly impressive visual design. Also that pig is really freakin' scary. When you hear the name George Romero, you logically think of zombie classics like Night of the Living Dead and Dawn of the Dead, and since the man is the godfather of the zombie genre, we sometimes forget that he also directed solid terror tales like Martin (1977), Creepshow (1982), and Monkey Shines, a strange but undeniably effective thriller that features the most nefarious Capuchin monkey since the evil Nazi monkey in Raiders of the Lost Ark. It sounds potentially ridiculous (and perhaps borderline distasteful) on the surface—a paraplegic man slowly comes to realize this his "helper" monkey is actually a genetically-enhanced super-primate who holds a serious grudge and has no problem murdering anyone who wrongs her master—but thanks to a strong cast and Mr. Romero's deft balance of melodrama, suspense, and good old-fashioned sci-fi/horror, Monkey Shines turns out to be quite an effective little shocker. Also: check out Link (1986) and/or Shakma (1990) for more movies from the "homicidal primate" department. While most of the killer croc (or gator) movies are either tongue-in-cheek (Alligator, Lake Placid) or plain old silly (Dinocroc, Croczilla), there are a few indie films out there that take the idea of huge ravenous reptiles pretty darn seriously—and a bunch of them showed up in 2007. Australian director Greg McLean followed up his gruesome festival hit Wolf Creek with Rogue, a surprisingly intense thriller about a bunch of tourists who end up stranded in a swamp with a seriously hungry crocodile. The same year, Andrew Traucki and David Nerlich's Black Water (also from Australia!) delivered a fact-based tale about a few ill-fated friends who go fishing in the wrong spot. Both films earn big points for favoring patience and suspense over dumb jokes and easy carnage, plus each film boasts some pretty terrifying moments of croc-related horror. And if you feel like making it a triple feature, check out Michael Katleman's Primeval, which also came out in 2007. It's not quite as impressive as the other two films, but it does feature some lovely cinematography, a (mostly) straight face, and a nice batch of gory mayhem. Contrary to how it may seem, there actually are some pretty decent shark flicks besides Jaws (and, yes, Jaws 2). At best we generally get goofy stuff like Deep Blue Sea or Shark Night 3-D, and at worst we get mindless wackiness like Sharktopus and Sharknado 3. But not always! Open Water is an almost maddeningly suspenseful story about a couple who get left behind during a scuba diving excursion in the Caribbean ... and of course these are shark-infested waters. Like many indies of this ilk, Open Water is also based on actual events, which only adds an extra layer of intensity to the dire proceedings. Not a whole lot actually "happens" in Open Water, but it's still a remarkably intense film. The Reef comes from one of the Black Water directors, is also based on actual events, and also focuses on a boat full of friends who have to choose between sitting on a sinking ship and swimming across the shark-infested waters of a brutal Australian reef. So if we're keeping score at home, it sure seems like the killer shark (and croc) movies that are based on actual events are crafted with care, caution, and restraint—while the fictional shark (and croc) movies are mainly interested in bikinis, broad comedy, and rampant carnage. With the exception of 1997's The Edge, which does stand out as a highlight, we unfortunately haven't seen all that many well-made killer bear movies over the years. Adam MacDonald's low-key and quietly suspenseful Backcountry does an admirable job of giving us at least one killer bear movie we can recommend without sheepishly referring it to a "guilty pleasure." Loosely based on actual events, of course, Backcountry takes the Open Water route by letting the audience get to know our Average Joe & Jane couple, lulling us into a sense of calm, and then plowing forward with some serious shocks, scares, and sustained tension.